Women on a Mission: Mom Edition: MOUTHWATERING MONDAY: DON'T GET SAUCY! Shaun’s job requires him to organize and monitor live and online state auctions. About once per month the live auctions (on Saturdays) are put on. It’s a long week prepping, and a long day putting the auction on, so he’s pretty tired by the time he gets home. This weekend was just such an auction – and to top it off it rained half the day (auction outdoors!). What’s better than to come home after a long, wet and rainy work week than a big plate of spaghetti? Shaun thought that was a great idea. But a kink in the plans: Lori was in town for our too-short get-together on Saturday morning. Thankfully Thrifty Nana came through in the clutch and made a BRILLIANT spaghetti sauce for us. She even boiled the linguine so we didn’t have to do anything but heat the whole meal up. Woot! Red Peppers were in the fridge! PERFECTION! Bubble until it’s hot and thickens slightly (to your preference – the longer you bubble uncovered, the thicker it’ll get). That, my Friends, is all she wrote. Neen had linguine or fettuccine pasta (I’m not sure which). We like almost any kind of pasta; I like to use whole wheat pasta. Sometimes we do this with my homemade gnocchi, but that’s a different post. 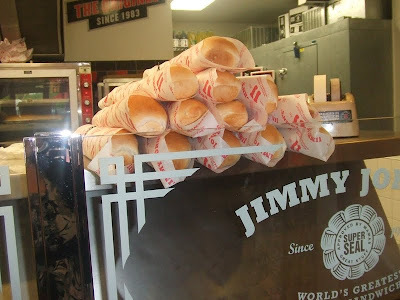 THRIFTY TIP: When Lori and I had lunch at Jimmy John’s, I picked up a loaf of their day-old bread for $.50!! It’s awesome. I intended to have this as garlic toast with the spaghetti, but then I remembered that if the girls see bread on the table, they won’t eat anything else. So we used it for French Toast this morning instead. Perfection! Day old bread--WHO CARES? Still delicious! I usually keep a wedge of parmesan cheese in the fridge and grate that when I want it, such as an Italian meal of spaghetti, lasagna or risotto. Yum. And the wedge is way cheaper – about $5 per wedge, and you get loads of use out of it. Plus, when only the rind is left, you can bubble that in broths, soups or sauces for a ton of flavor (then take it out and discard). Bottom line, Thrifty Nana made us a delish batch of spaghetti. Thanks Mom! The perfect home-cooked meal for Shaun to come home to. You may all have your own methods for cooking spaghetti, and for those of you in Italy who read our blog (yes, we do have viewers from there! ), don’t get upset if we’ve completely Americanized your red sauce – our version is still darn tasty!